Today we announced that we are evolving the design of Wear OS by Google to help you get the most out of your time - providing quicker access to your information and notifications. Notifications can come from the automatic bridging of the phone's notification or be generated by a local Wear app running on the watch. Whether you are a phone developer, a Wear app developer, or both, there are a few things you will need to know about the new notification stream. Until now, each notification took up the entire screen in Wear OS. Although this provided more space to include things like inline action, it also meant it took a long time for the user to go through all their notifications. The new notification stream is more compact, and can display multiple notifications on the same screen. This means users can process their notification streams more quickly. Concise notification content is even more important. The new unexpanded notification on Wear will show up to three lines of text. Because this is already more information than a single line unexpanded notification on the user's phone, if your notification works on the phone unexpanded, it should be fine on Wear. Brand notification with color. The default title and icon color for notification is white. Developers can now convey their brand identities by customizing the color of the title and icon tint using setColor. Custom notification layout will no longer be supported. Previously developers used setDisplayIntent to inflate a custom activity inside the notification stream. We have found that the custom layout often does not take into account of the device form factor, and is difficult to keep up to date as Wear OS's notification experience evolves. As a result, we will no longer support this in notifications. Inline action is being reviewed. To save space, the new layout no longer display inline action in the stream and setHintDisplayActionInline will be ignored. Users can continue to access notification actions including inline action when they tap to expand the notification. Our design team is reviewing whether we should include inline action in a future release. As a result, before a decision is made, we are not deprecating the related APIs. We will keep the developer community updated in due course. As always, the current best practices for notification still apply. In particular, for messaging apps developers, we strongly encourage the use of MessagingStyle notification and enabling on-device Smart Reply through setAllowGeneratedReplies. 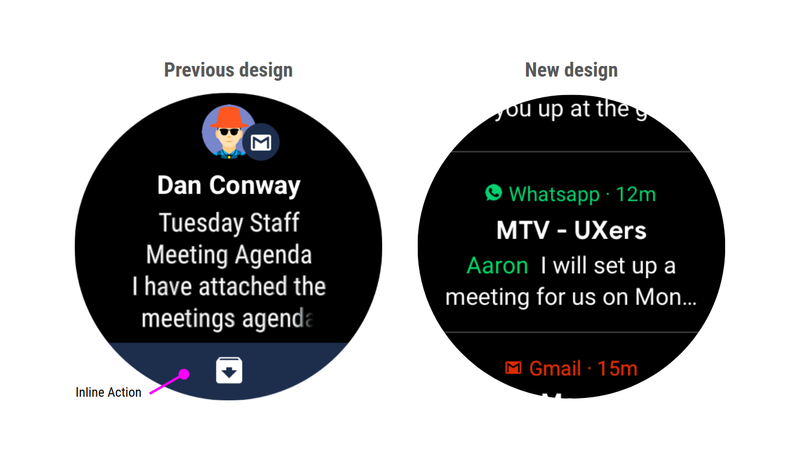 We will start rolling these changes out in the next month, so watch for updates on your Wear OS by Google smartwatch!